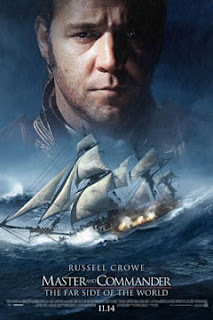 I saw Master and Commander earlier this year, and was very impressed with the visuals, and I agree Peter Weir captured the time period very realistically. I only wish I has seen the film in the cinema! You wonder how they did some of the effects, do you know if CGI was used? @moviesandsongs365: Thanks for the comment. I was lucky enough to see this film in the cinema, and it was a great experience. While I can't say for sure whether CGI was used or not (I know Weir shot some footage in an actual typhoon for the film), I'm guessing the battle scenes were at least partially CGI. emrecnl: Enjoy! It's a good movie. I went to see this movie not expecting much. However, I was extremely impressed with this film. Once again, everything came together under a fine director, an exceptional cinemaphotographer, and excellent acting.